AHRS works with ForeFlight in this new configuration? No – the AHRS feature does not work with FF at this time. We hope to convince them to work with us in the near future. All the other features of FlightBox work with FF. I assuming this approval does not allow the flightbox to be used to satisfy the 2020 ads-b mandate? Correct. 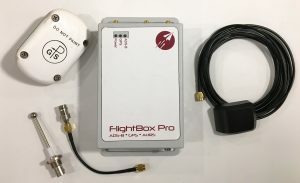 FlightBox Pro is a receiver – ADS-B In. The 2020 mandate calls for ADS-B Out. It does work with the ADS-B and GPS features. AHRS is the only thing that is not currently supported. And while I like ForeFlight, there are many other great EFB apps out there. FlyQ EFB is actually the current top rated app, not Foreflight. Does this use WiFi or Bluetooth to connect to the tablet? What about a battery backup? It uses Wifi – it creates an access point to which your tablets and smartphones connect. No backup battery at this point, though we may consider building one at a later date. Is the AHRS upgrade in a FlightBox we lucky 200 already have, with the new software, going to be in effect a FlightBox Pro for non permenant installation (or even permenant Installation)? I am assuming and hoping that is the plan. How is the standalone software for the AHRS coming (incase Foreflight continues to stonewall you)? WIll that be available when Pro is released? It’s pretty close. The pro has a DC-DC converter that lets it connect with ship’s power. It has dual USB accessory ports. The Pro case makes it easy to mount. And of course it comes pre-assembled, tested, burned-in, and with a one year warranty. I spent some time over the weekend working on the utility app for iOS which will have the attitude display. You can also use the display that’s part of the web interface on the new beta. It’s actually pretty good, if not very conveniently located. My goal is to submit the iOS code to Apple by this next weekend. and have FlightBox Pro connected to the same antenna? What about stick-and-ball antenna? You might be able to find a GPS signal splitter, but it would likely be more expensive than another (used) antenna. Splitting a really low-power signal like GPS is usually a bad idea. You cannot use a splitter with the stick/ball L-band on your transponder – that would fry the FlightBox’s receivers. You can use a separate L-band antenna that is located at least four feet from any transponder, DME, or UAT transmitter antenna. You will need a splitter to feed it into both the 978 MHz and 1090 MHz SMA ports on the FlightBox Pro. Each will get only half the signal it would receive if it had its own antenna, but I’ve found that to be generally acceptable – I still see 3+ UAT towers and 1090-ES traffic as far out as 50 miles. Hi Steve. I have tried to install the 2nd beta program for the ahrs. For some reason it will not take. When I do it the FlightBox shuts down and about 30 seconds later it starts up again, but alas the upgrade did not take. Will this be included in the approved software coming out shortly. Yes – it will be incorporated into the main firmware and made available for installation through the FlightBox Utility app on iOS and (hopefully) Android. If you get a chance, please send me a screen shot of your status page from the web interface. I’m afraid not. Because it’s FAA certified we have to keep the Pro completely separate from our DIY and portable systems. You can upgrade your FlightBox with most of the same features, but it can’t be made into a Pro and installed permanently.